HarperCollins is proud to present its new range of best-loved, essential classics. 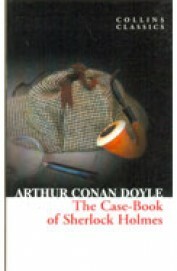 Featuring the last 12 stories ever written about the infamous detective, The Case-Book of Sherlock Holmes contains some of Conan Doyles most villainous and unusual characters. The 1920s was a disenchanting era, and the darker mood of many of these stories reflects the environment at the time. Some even felt that the stories showed Conan Doyle exploring Spiritualism as it was an area he was interested in at the time and the mental derangement and physical disfigurements that crop up in many of the stories allude to the horrors of the First World War. The collection includes The Adventure of the Sussex Vampire, The Adventure of the Creeping Man and The Adventure of the Lions Mane. Sir Arthur Conan Doyle (1859-1930) was a Scottish writer and physician, most famous for his stories about the detective Sherlock Holmes and long-suffering sidekick Dr Watson. Conan Doyle was a prolific writer whose other works include fantasy and science fiction stories, plays, romances, poetry, non-fiction and historical novels.